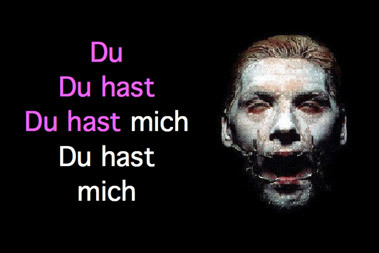 I added lyrics to a Du Hast MIDI file, so now you can sing along with Rammstein. I particularly enjoy this MIDI file because the vocals in the song are essentially one note over and over again, very boring, and pretty darn ridiculous in combination with the limitations of MIDI. .KAR files can be read by Quicktime inside the browser, or you can download them and play them in Quicktime player. They are freaking neat, here's some more files + info. Hello friends! Thanks for having me on your great blog today. Blogger is blessed to have you on board! Music is the future! But, do you as a music lover need free debt consolidation? Well, look no further. I help you for free my friend. I have tried and tested all sites But, the best was debt-consolidation.com. So, let me help you. Fill in the form today for free. And be debt free. Get credit repair today! and really happy to have my loans off.